Social Security and the Washington Post: Who Is Going Down First? This is the question that millions are asking. And, we have the answer for you. 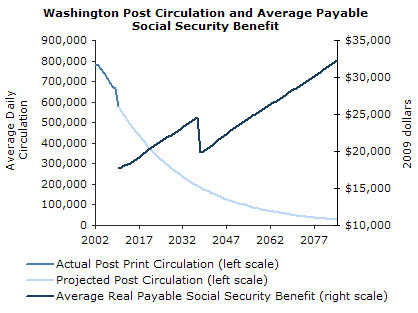 The chart below projects out the payable real Social Security benefit for an average worker retiring at age 65. These numbers are derived from the intermediate projections in the 2010 Social Security Trustees report. Note that the benefit is in 2009 dollars, meaning that it is adjusted for inflation. The numbers for the Washington Post show the actual decline in circulation from 2002 to 2010 taken from ABC Reader Profile Studies and ABC-Audience Fax E-Trends Tool. For later years it projects out the 3.7 percent average annual rate of decline over this period. Note that, even if nothing is ever done, Social Security will always be able to pay out a higher real benefit than is received by retirees today. After 2037 it would no longer be able to pay full scheduled benefits, but the payable benefit in 2038 would still be 12.1 percent higher than what the average retiree gets this year. The payable benefit in 2085, the last year in the planning period, would be nearly twice the average benefit in 2010. The prospects for the Washington Post don't looks quite so good. Its average daily circulation in 2010, at 580,000, is already 25.9 below its 2002 level. By 2038, when Social Security is first projected to face a shortfall, on its current path, the Post circulation would have dropped by 68.1 percent to 185,000. By the end of the Social Security's planning period in 2085, the current trend would put the Post's average daily circulation at 27,000.